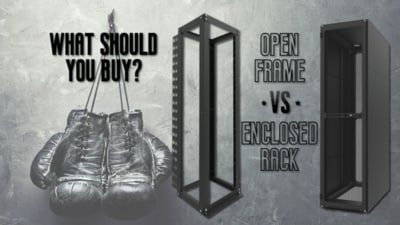 Enclosed Rack vs Open Frame Rack: What should you buy? When shopping for a server rack, you will need to decide which designed type is best for your situation. The two major options are open frame racks and enclosed racks. Both offer advantages and disadvantages based on things like the type of equipment you are using, the floor space available, and other details. Learning about the pros and cons of both open frame racks and enclosed racks is a great place to start. Price – Open frame racks typically close about 1/3 as much as a similar enclosed rack. Companies on a tight budget can really benefit from this. Air Flow – There is nothing obstructing the air flow, which can help to improve the cooling of the computer equipment. Access – Working on servers and other equipment is easier since there is no caging or other things to get in the way. Protection – Enclosed cabinets can be locked to provide added protection from unauthorized people accessing the equipment. This will also help to prevent damage to devices from accidental bumps things falling into it. Airflow Control – While open frame racks allow for full airflow around the equipment, enclosed cabinets can have fans and other cooling devices installed. This allows for greater airflow and cooling control. Hiding Cables – The enclosed cabinets can hide cabling away more effectively, which gives a better appearance and can also help to reduce the risk of cables getting damaged. Understanding where open frame racks have trouble is also important. The following are some of the negative aspects of using an open frame rack. Lack of Security – Anyone can walk up to one of these racks and unplug it, push buttons on it, or anything else they desire. Dust – The equipment mounted on an open air rack is much more susceptible to dust and other debris, which can cause problems over time. Cabling – The cabling is visible, which gives it a ‘messy’ look in most situations. The cables are also less secured in place, which can lead to them being pulled or stressing the ports in which they are plugged into. Cost – Enclosed cabinets are made with additional materials, which causes them to be significantly more expensive. Accessibility – When it comes to installing or working on equipment in an enclosed rack, there is less room to maneuver to get the work done. This can make it more difficult and time consuming to get work done. Moving – If you need to move the racks at any point in the future, enclosed racks are much heavier and more difficult to move. Both of these options are very popular, and neither can really be considered better than the other. It will all depend on the type of equipment that will be in the racks, the budgets, the amount of room available, and other factors. Many companies even use one style for some equipment, and the other style for others. Take some time to evaluate which would be best for your company before making any purchase decisions. An enclosed rack, or cabinet, and open frame 4 post racks both offer their fair amount of advantages over each other, depending on the users needs.